I have a WRT1900ACS with CC 15.05.1 flashed. I was trying to configure my VLANs but I cannot find the Switch menu under Network tab that I got on my other OpenWRT-flashed routers. I tried flashing the previous official release (15.05) but I did not get the Switch tab either. But whenever I try to configure a VLAN, not only it does not work, but it bricks the router to the point I have to manually revert it to stock settings. I guess it has to be enabled by other means in order for it to work. Exactly same problem here, also WRT1900ACS and CC 15.05.1! One thing I figured: It's not bricked, just that you don't get access anymore through the LAN ports. I was still able to access LuCI and SSH via Wifi. So was able to revert the config without having to factory reset everything. indicates that VLAN should be working fine. However other posts mention that the stock image will not work for VLAN on WRT1900ACS. Others said you need to install the ip package via opkg (as opposed to using the stock busybox command). I'm going to try these things out and let you know again. Please also post if you have found a solution in the meanwhile. Thanks sera, that did the trick! 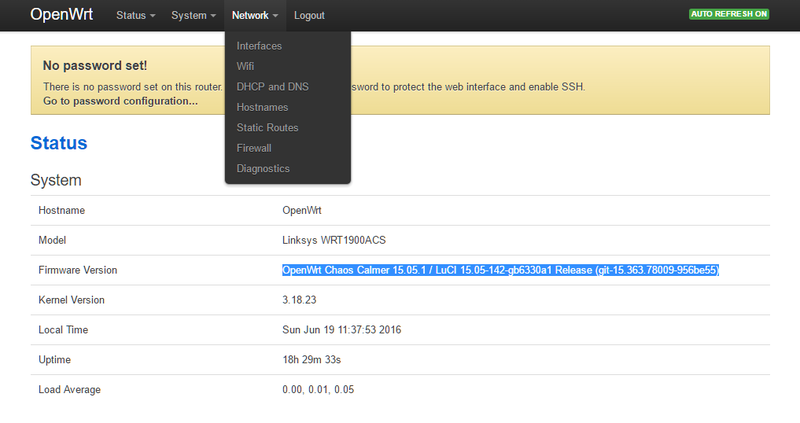 I added your config to /etc/config/network and the Switch tab appeared in LuCI, also the router was not hanging anymore. Port6 - CPU [LAN] - thanks sera! That's all. Finally my ACS was able to pick its IP via DHCP from my ISP's ONT (Optical Network Terminal). You're welcome, Port6 is the other cpu interface (eth1). Hello guys. I have the same Issue, I don`t have a switch menu. I am new at all this and started playing with openWRT only couple of days ago, because my WRT1900acs V1 started to reboot constantly, lose 2.4MHz network, and in general perform poorly. Now I have managed to sort out the wifi, and all the needed port forwarding and etc, but I need to setup vlans for my IPTV boxes. And I cant find anywhere how to do it. I noticed that I am missing the Switch menu selection. Can anyone tell me how exactly I could activate it? The answer is in post 3 and 4 above. Check if your /etc/config/network file contains a section like Sera posted in post 3, if it does not, add it, reboot and the switch tab should be activated. Also as noted above, before working on the switch, configure a wifi AP and log in via wifi. That will continue to work if you misconfigure the Ethernet. This has probably been fixed in later versions.